I would like to tell you about one of my students. Her name is Begoña and she was studying for the B2 during the summer of 2018. She came to me for intensive classes to prepare for the B2 Escuela Oficial speaking exam. Begoña passed the exam and I think her note taking helped her a lot. She made a great effort to study and revise the notes that I generated during our classes and would speak to me in the subsequent classes about doubts she had from my previous notes. Have a look at some of her notes here. This is the level of studying that you have to do to improve your English and take yourself to the next level! There may be mistakes in Begoña’s notes but that is ok. It is part of the process. If you notice mistakes in your notes that is good. It means that you are learning and improving. If you’re learning a new language it will help you a lot if you are an organised person with good handwriting. 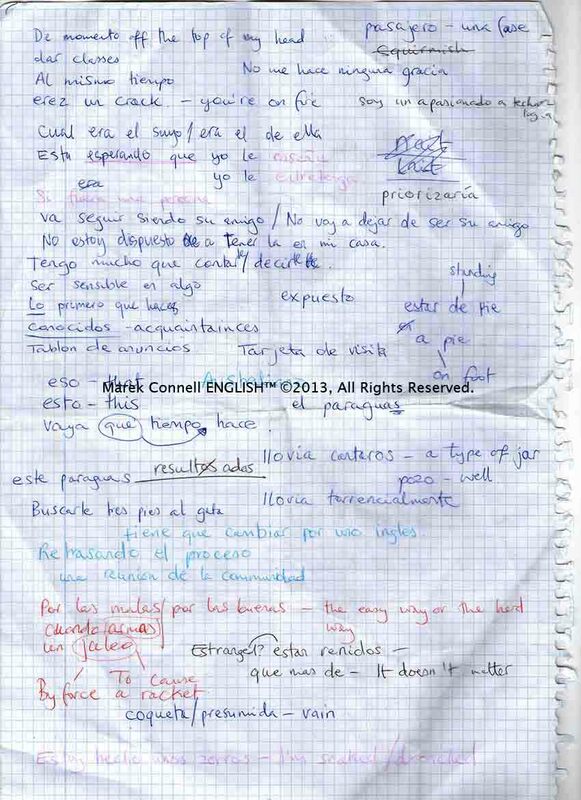 At the bottom of this page you can download the first 50 pages of the notebook that I created to learn Spanish. It can be equally helpful in helping you learn English! More importantly it will show you good ways of making your own notes so that you can learn more effectively and faster. I have lived in Valencia Spain for just over 4 years and I spent the first year and a half studying Spanish around 10 hours a week (5 days a week) via “intercambios”. My method was to take notes while I spoke about things that I was interested in and then copy those notes into a clean notebook. I carried my notebook with me everywhere. If I was stuck in a queue at a bank for example, I would take the notebook out and start to casually read a random page. You need to see/read/hear/say a word/expression in context around (5) times before you can really internalise it. A good, neat and well organised notebook will help you to achieve this. During my “intercambios” (1)I said or heard the word once. (2)I would then write the word down on some scrap (sucio)paper. (3) I would copy the information from my scrap notes into my notebook. (4) I would revise the notes when I had the opportunity. This way, just from my language exchanges, I would expose myself to the information that I learnt 3 or 4 times and very quickly internalise the information. Use different colours to distinguish more important imformation. Make diagrams so you can see how different/ similar information relates to each other. Click on the link below to download my Spanish English notebook.